What's deal with non-stick cookware? Is it safe? Aussies have been flipping eggs and turning snags in their non-stick pans for decades now. But many consumers know little about the health concerns linked to the chemicals used to manufacture some non-stick surfaces. So are they safe to use? It was in 2004 that the American Environmental Protection Agency (EPA) discovered the potential cancer-causing chemical used in the production of Teflon and filed complaints against the maker, DuPont, under the Toxic Substances Control Act (TSCA) and the Resource Conservation and Recovery Act (RCRA). At the time, Teflon was manufactured with a synthetic chemical called perfluorooctanoic acid, which is also known as PFOA or C8 for short. However, it was phased out in 2013. PFAS chemicals, which includes PFOA and PFOS, have been widely used to make products more stain-resistant, waterproof and/or non-stick for more than 60 years, but they have been linked to cancer and numerous other health concerns. Despite DuPont completely eliminating the use of PFOA from use in their products, according to a spokesperson for the Australian Competition and Consumer Commission (ACCC), there is a wide range of products supplied in Australia that still include the related chemicals. "These products include non-stick cookware and appliances, stain-resistance sprays, and products specifically treated to be stain-resistant or water-resistant, such as outdoor clothing and equipment. Usually these products will be labelled to indicate they contain, or have been treated with a related chemical." Once scratched, non-stick pans and cookware begin to degrade. And all those surface chemicals inevitably end up in your food and then inside your body. Exposure to PFAS chemicals can be carcinogenic and are linked to have a number of adverse health and environmental concerns. According to the ACCC, "while these chemicals have useful properties, they are also highly resistant to being broken down, are persistent in the environment and are known to bioaccumulate in animals and humans." "Large-scale epidemiological studies are contributing to our understanding of any effects of these chemicals in humans, but currently there is no scientifically established link between PFCs and Teflon and human health effects." One of those large-scale studies is being carried out by the EPA – and they have different findings. "If humans or other animals ingest PFASs (by eating or drinking food or water than contain PFASs), the PFASs are readily absorbed, and can accumulate in the body," according to the EPA website. "As a result, as people get exposed to PFASs from different sources over time, the level of PFASs in their bodies may increase to the point where they suffer from adverse health effects." "Studies indicate that PFOA and PFOS can cause reproductive and developmental, liver and kidney, and immunological effects in laboratory animals. Both chemicals have caused tumors in animal studies. The most consistent findings from human epidemiology studies are increased cholesterol levels among exposed populations, with more limited findings related to low infant birth weights, effects on the immune system, cancer for PFOA, and thyroid hormone disruption for PFOS." If exposure to the chemicals is higher, the health effects are worse. According to the EPA's Drinking Water Health Advisory for Perfluorooctanoic Acid (PFOA) report, "human epidemiology studies of a community identified an increased risk for kidney and testicular cancer in people who were highly exposed to PFOA." The report also showed other, non-cancer health concerns associated with PFASs (PFOA and PFOS over certain levels), including changes in cholesterol, developmental effects to foetuses during pregnancy, liver effects, such as tissue damage, immune effects, such as depressed antibody production in response to vaccination, and thyroid effects. The good news is that certain PFAS chemicals, including PFOA and PFOS, are no longer manufactured in the United States. This is the result of voluntary phaseouts and the PFOA Stewardship Program, although there are a few exceptions for limited industrial uses. In 2006, the EPA struck a deal with eight major chemical manufacturers, including DuPont, then makers of Teflon, who "committed to eliminate by 2015: the use of PFOA and PFOA-related chemicals in their products, and PFOA and PFOA-related chemical emissions from their facilities," according to the EPA. DuPont completely phased out the use of PFOA in 2013, and since then, the company has worked closely with regulatory agencies to develop replacement materials, which provide comparable properties and benefits with improved health and environmental profiles. DuPont separated its performance chemicals segment in 2015 through a spin-off to shareholders, resulting in two standalone companies. The independent spin off company, Chemours, now sells Teflon. PFOA and PFOA-related compounds are currently under consideration for listing under the Stockholm Convention on Persistent Organic Pollutants, but have not been listed at this time. And despite the health concerns, these chemicals are still made around the globe. And they are still available to buy in Australia. 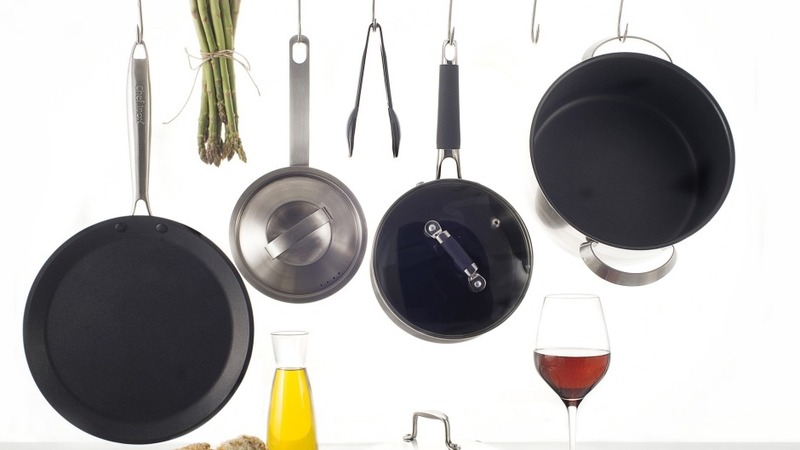 In fact, the non-stick coating cookware industry has grown significantly. So what is Australia doing about these chemicals? According to the ACCC, "some riskier chemicals are regulated to limit exposure of the general public to them, but there is no evidence to suggest that additional regulatory controls are needed for consumer goods that use them." "Suppliers of products are expected to ensure that their products are safe and suitable for their intended purpose. While there are no safety concerns at this stage, consumers should always follow the instructions for the products they use." "For non-stick pans, this means that the pans should not be overheated and only used at the cooking temperatures indicated in the instructions. Pans should be cleaned according to the manufacturer's instructions." The ACCC say consumers can choose to avoid using non-stick cookware and appliances, as well as products that are treated to be stain-resistant or water-resistant. "Consumers can choose to avoid using non-stick cookware and appliances, as well as products that are treated to be stain-resistant or water-resistant. Consumers who are concerned about using related chemicals can ask suppliers details about products to inform their purchasing decisions." 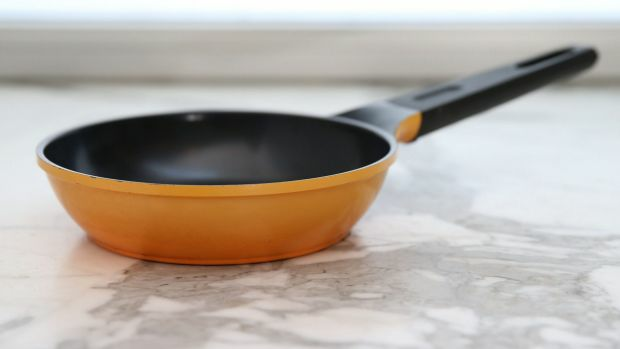 "When using cookware with non-stick coatings, consumers should follow the manufacturer's instructions, avoid using oils with high smoke-points, such as refined safflower oil, avocado oil and rice bran oil, and avoid heating their cookware to extreme temperatures. As a further precaution, consumers can choose to discard cookware and appliances with damaged non-stick coatings." So is that the end of our non-stick kitchen staple? No. According to CHOICE, Australia's leading consumer advocacy group, there are safe non-stick pan options. 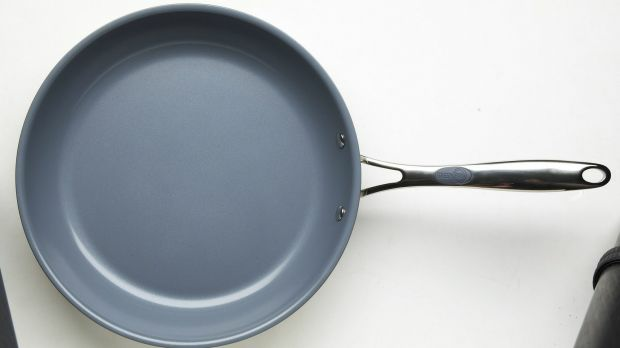 "The latest non-stick frypan CHOICE test now includes some non-stick pans that claim to be free of Polytetrafluoroethylene (PTFE) and Perflourooctanoic acid (PFOA) – the harmful chemicals in question," according to CHOICE. 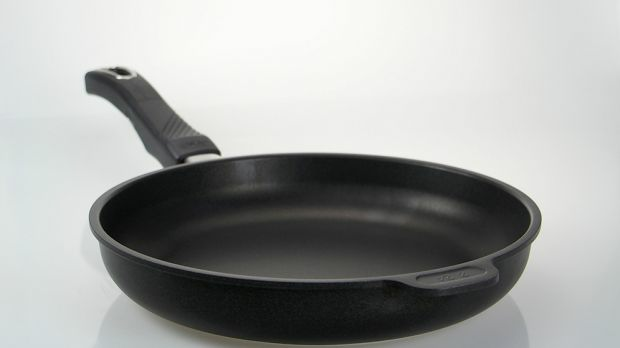 "However, we should start to see more and more PFOA-free frying pans on the market." CHOICE says you can reduce the risk of toxins being released by using your pan properly and looking after it so the coating isn't damaged. And, practice these safe cooking tips. "Don't overheat an empty non-stick pan or leave it unattended on the cooktop. The chemicals used in non-stick coatings can start to break down and release harmful toxins in temperatures above 260°C. Research suggests that no toxins are released from cookware used at or below normal cooking temperatures." "Never heat fat or oil at maximum temperature to the extent where it overheats." "Use only wooden or plastic utensils to avoid scratching, even if the manufacturer says you can use metal ones." "Hand wash your pan with a sponge and slightly warm water; let it soak in hot water to remove stubborn residue. Never use steel wool or heavy-duty scrubbers." Check these out and you'll be cooking up a safe storm. Go for the highest grade stainless steel your cash can buy. Stainless steel is a stable heat conductor and excellent for cooking. However, stainless steel comes in many different grades, and concerns have been raised over poor-quality stainless steel leachinging nickel, a toxic chemical, into food. Make sure your pan has a non-porous surface, so you won't have to add lashings of cooking oil to prevent sticking, and the surface is intact to avoid leachinging – that means no scrubbing and scouring with abrasive steel wool. 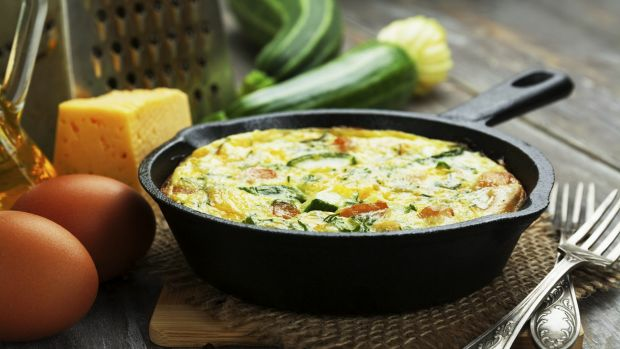 There are several reasons why people love cast-iron cookware. It's an ideal heat conductor, heating evenly and consistently, and with the proper care, it will last for eons. It's important to season your cast-iron cookware prior to use (follow the manufacturer's instructions) to promote the non-stick surface properties and to prevent rusting in the pores, which, if occurs, can leaching into your food. Stoneware has been used for thousands of years for baking and cooking. Stoneware heats evenly, is non-stick when seasoned, scratch resistant and it can be heated to very high temperatures. Stoneware is made primarily from either naturally occurring stoneware clay or non-refractory fire clay, but check that it is made from lead-free clay and buy from a reputable manufacturer who provides a warranty. Bonus: it's easy to clean with warm water or by wiping down with a cloth. Avoid using soap, which can strip the oil (seasoning) and non-stick qualities – and effect the taste of subsequent meals. What do chefs cook when they have friends over for dinner?